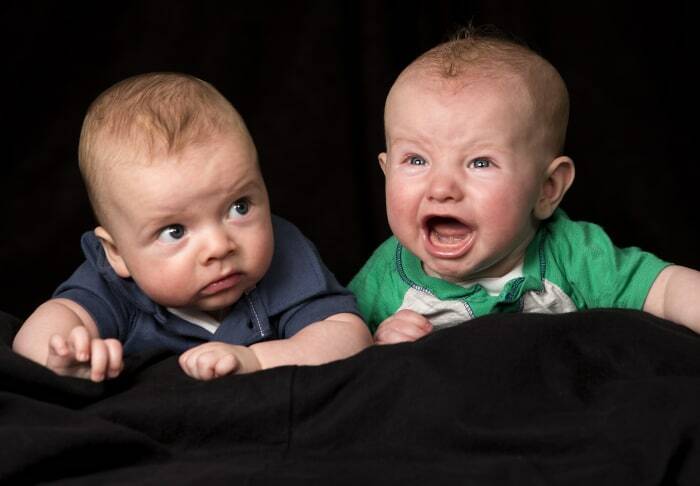 Cousins Markham Reid Carter, left, and Lucas Dowell Richardson show how babies as young as 5 months old can communicate. They may not talk yet, but it turns out babies can recognize each other’s emotions by 5 months of age, correctly matching the sounds of happy or frustrated infants with the appropriate facial expressions. “It highlights the fact that babies are really sensitive to our communicative intent,” Flom told TODAY Moms. Researchers weren’t too terribly surprised at the results. Studies have shown babies can match emotions in adults at 7 months of age and younger. But there has been little research so far looking into infants’ perception of the emotional expressions of other infants. Forty babies took part in the study: half were 3.5 months old, and the other 5 months old. During the experiment, the infants sat in front of two monitors. One showed video of a happy, smiling baby while the other played footage of a second sad, frowning baby. Then, audio was played of either a happy or a sad baby. The recordings were not in sync with the lip movements of the babies in either video. When hearing the “happy” audio, the 5-month-old infants looked longer at the video of the baby with the positive facial expressions. Similarly, when hearing sounds of a frustrated infant, the 5-month olds were also able to match the “negative vocalizations” with the video of the sad, frowning baby. Researchers didn’t see that matching ability among the 3.5-month-old infants in the study. Of course, parents already know infants can “read” each other just fine, as evidenced by this blockbuster YouTube video starting 17-month-old twin brothers partaking in some intense baby babble.